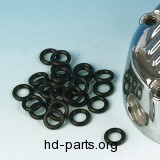 Where can I get O-RING ? If you look after new or branded parts the best choice is: JP Cycles They have the largest selection and availability of Harley Davidson genuine parts, Period! You can search through the site either by keywords: (O-RING) and OEM#: 11179...use the search box on top right corner for that OR you can search by model (FXSTB NIGHT TRAIN JA) and year(2009) use drop down menu for selection on left side. All orders above 99 USD are shipped FREE of charge and you have a 120 day return policy. They have great prices and excellent, top rated customer service (world wide shipping). Otherwise if you look for after market Harley Davidson genuine parts, big forums like hdforums.com or subreddits (reddit.com) is the way to go. Make sure that you use descriptive keywords when you post to community forums, members will more often recognize Harley parts as keywords: O-RING then just OEM numbers. This way you will for sure receive more responds to your thread. If you find that #11179 number is wrong and that it doesn't belong to Clutch lever assembly (#22) list or if you notice any error on current page please let us know.